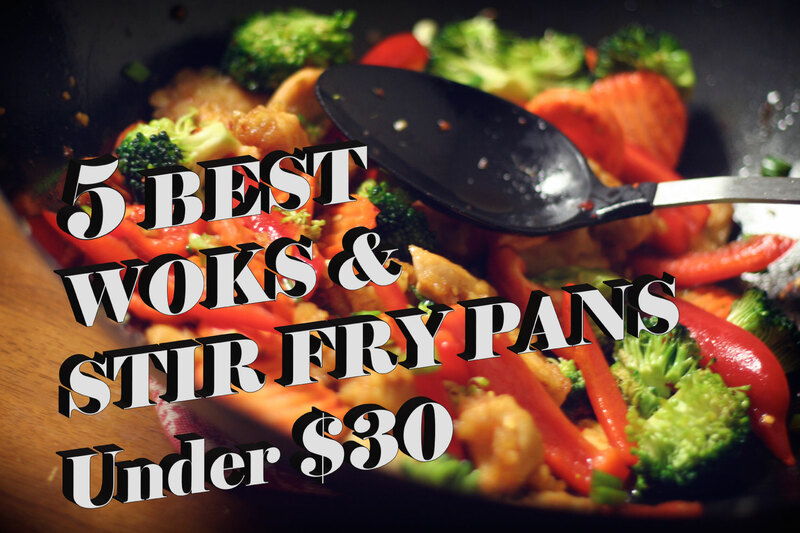 Finding quality cookware for a low price isn’t an easy task, especially when it comes to woks and stir fry pans. Any old bowl-shaped vessel just will not do. 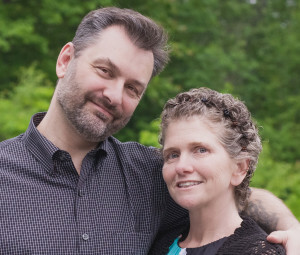 If you're looking for a bargain, then you've come to the right place, because we researched dozens of candidates that fell below the thirty-dollar threshold. 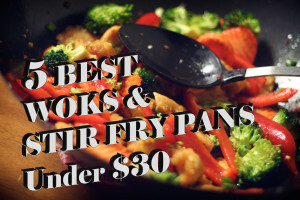 Several showed potential, but we narrowed down the list five of the best woks and stir fry pans available for under thirty dollars. 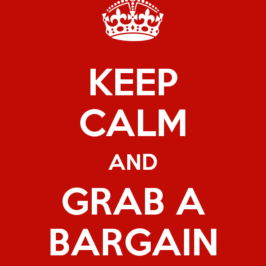 If you’re looking for a bargain, then one of these should suit your needs. Note: All prices are as of December 27, 2015. The T-fal A80789 Jumbo Wok is a wok designed to please an entire family on stir-fry night. Not only is 14 inches wide, it’s 5 inches deep, so there’s plenty of room if you need to prepare a large meal. The helper handle comes in handy for this task as well. The T-Fal Jumbo Wok is constructed of aluminum for quick and even heating, and has a nonstick coating inside and out. It’s oven safe to up to 350 degrees and dishwasher safe (though there wouldn’t be room for much else). If there is anything disappointing about this wok, it’s that it doesn’t come with a lid. Amazon suggests purchasing the Joyce Chen Steel Dome Lid for 14-Inch Wok ; we’re fine with that suggestion, though any lid that fits a 14-inch wok would do in a pinch. The Ecolution Hong Kong Chopstick House Wok is an eye-pleasing piece of Asian cookware that is made of heavy-duty carbon steel. It’s 6 inches deep and has a flat bottom that is induction-ready. It also has a silicone-wrapped handles, which adds practicality to its beauty. The Chopstick House Wok has a PFOA free nonstick coating. As with any nonstick surface, it must be treated with care. Silicone or plastic utensils are a must to keep the surface intact. And as long as you do, this wok should help you to make stir-fry meals that keep you and your family satisfied for years to come. The Chopstick House Wok doesn’t come with a lid. And because of the angle in which the helper handle rises from the back of the wok, it may be difficult to find one that fits properly. If you need one, of course. If you are looking for a little added authenticity into your stir-fry dishes, then the Canontese Style Wok from Town Food Service just may be the right choice for you. It’s 18 inches wide, 5.5 inches deep, and has a round bottom. 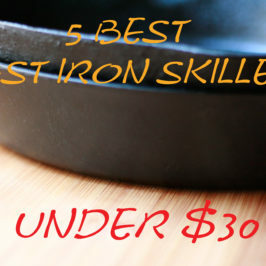 And since it’s made of cold-forged steel, it may have a rugged appearance many people might not be used to seeing in modern cookware. Much like a cast iron skillet, the Town Food Service wok requires a good seasoning before being put to use. This will help to build up a non-stick surface that is essential to stir-frying. Also, it shouldn’t be washed with soap or placed in a dishwasher, otherwise it will begin to rust. A drawback with this wok is the expected one. It has a round bottom, so it cannot be placed on flat cooktops. A remedy for this is to buy a wok ring to support the wok. Try the New Star International Steel Wok Rack . It’s inexpensive, and reversible, so it can support several sizes. While by no means considered high-end cookware, Farberware has long been producing quality, affordable products for over a century. It appears that Farberware 10-1/2-Inch Stir Fry Pan is no different. 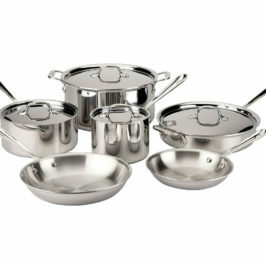 It’s aluminum construction offers even heating, and its small size makes it the perfect fit for cooking for one. The Farberware Stir-Fry pan comes with a Teflon Plus nonstick coating inside and out. This coating is oven safe to 350 degrees. It is dishwasher safe, so clean up should always be quick and easy. Just remember not to use metal utensils. 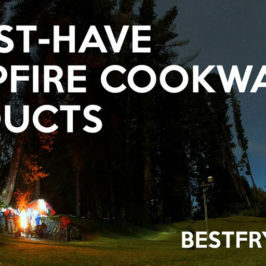 Those things can wreak havoc on nonstick. As far as the negative things about this particular wok: it’s small, it has no lid, and if you are concerned about PTFE, it does have a Teflon coating. If you aren’t concerned about any of these things, then you really can’t beat the Farberware wok for its price. The GreenLife Ceramic Wok from GreenPan, a company focused on environmentally-friendly cookware. It runs on the smaller side, as far as woks are concerned, and is just under 4 inches deep. It has a bakelite handle that stays cool while the wok is on the hob, and since it is made from aluminum, it heats evenly. The GreenLife Wok has a ceramic Thermolon nonstick coating that is PFOA free and oven safe to 350 degrees. Thermolon is GreenPan’s signature nonstick coating conducts heat in such a way that you can cook at lower temperatures. 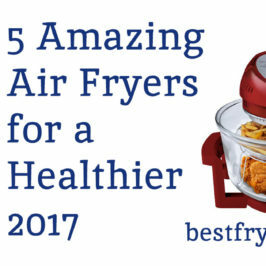 Also, it has great food release and doesn’t give off toxic fumes, even if overheated. It’s dishwasher safe as well. This wok does not come with a lid, however, it can be incorporated into the 14 Piece Greenlife Ceramic Cookware Set by GreenPan that has a 4.7 rating on Amazon. And since it is on the small side, you shouldn’t expect to be able to make stir-fry meals for more than two people. 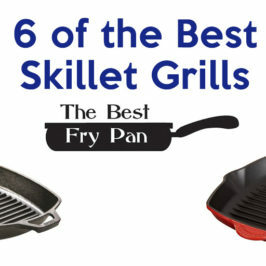 For the price, we really can’t snub any of these woks and stir-fry pans. That said, we considered the cooking capacity, the ability to clean, and reputation for quality. In the end, we chose the T-fal Jumbo Wok . We think it hits the highest marks all the way around. For a secondary recommendation, we’re torn between Town Food Service Canontese Style Wok and GreenPan's GreenLife Ceramic Wok . The former will please those who want a round bottom, though does require a wok ring for stability and more care than the other woks in this review. The latter is best if you make smaller meals, and not as much care is involved.